Golden Ears Provincial Park is one of the largest in British Columbia (over 62,500 hectares;1 hectare=2.47 acres) and features the pristine Alouette Lake. It also has three campgrounds and hiking trails through extremely rugged terrain. Vegetation is typical of the coastal western Hemlock forest of BC and the mountainous backcountry is not only rugged but has–almost annually–proven fatal to the unprepared. Those who go off are cautioned to understand what they’re getting themselves into. 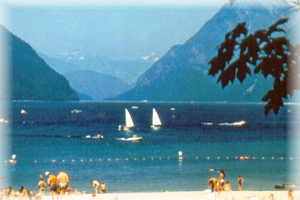 Normally, Alouette Lake looks just like this . . . But the day I attempted to paint this scene, it started out very foggy, then changed to drizzle, then showed some promise of clearing-up. I was in the camping area that was the most primitive, and of course only when I decided to begin painting did it actually start to full-out pour. By then I was so into it that I had to keep going, even though drops were falling directly onto my work-in-progress (though I did have a make-shift tarp). But to this day, this is one of my most favourite paintings because even though it has its distortions, I didn’t give in and stayed until I finished it . . . 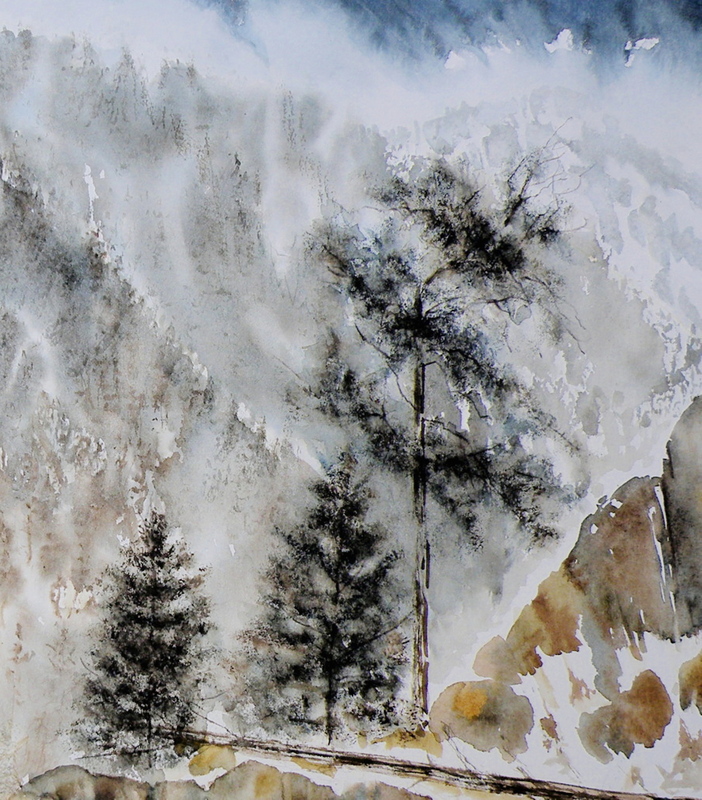 I can still smell the coleman stove coffee and feel the warmth of the mug against my numb fingers as I celebrated by putting my brushes away–and swearing I’d never paint another #%$#! 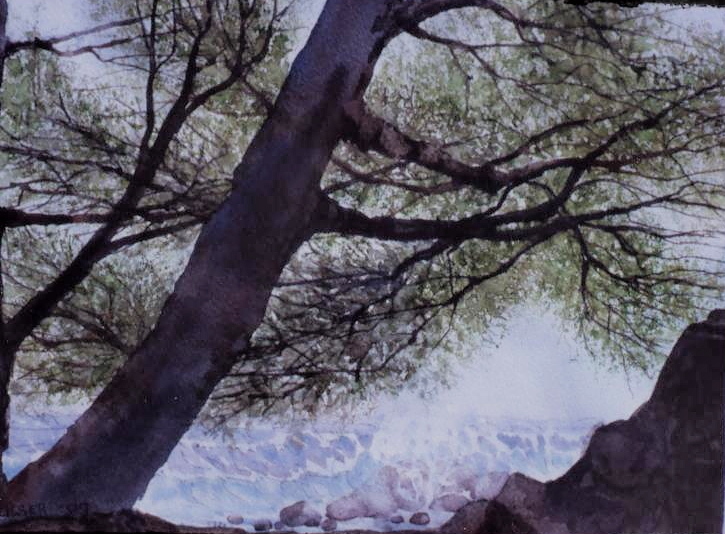 @# watercolour again in my life. Taking the 40 minute ferry from Vancouver one reaches Gibson’s Landing, the beginning of the 85 km. stretch known by British Columbians as The Sunshine Coast. The road leads North towards Alaska, but ends at Powell River–the furthest major city on the coast–and visitors simply have to either turn around and come back, or decide to permanently stay. 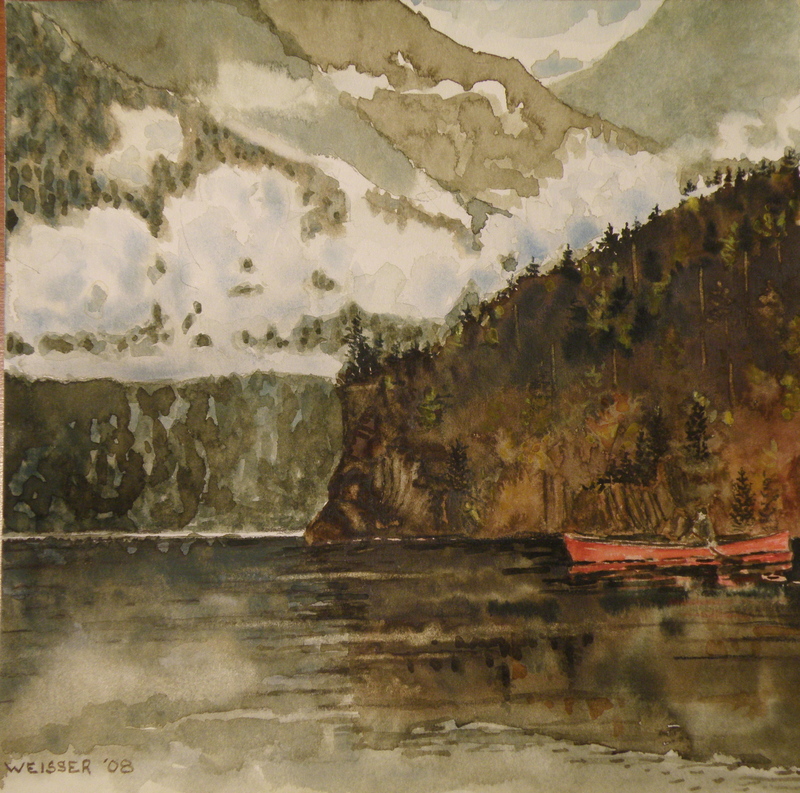 This watercolour was painted on location on a section of the Sunshine Coast near the town of Sechelt. 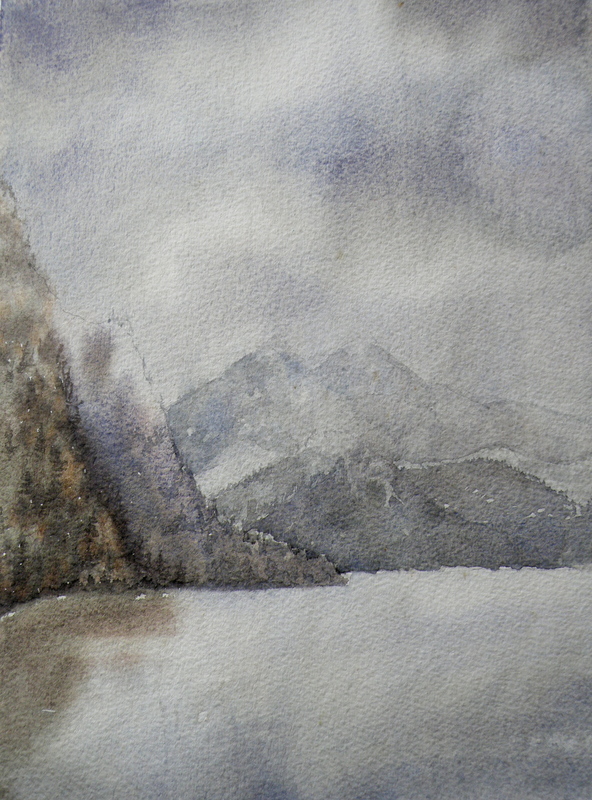 The wind was blowing across the Pacific, creating large breakers and bringing in a bank of fog which made it difficult to dry my paper enough to keep going. Kamloops, British Columbia, is privileged to have an area within walking distance of the downtown core that features many historic and stately homes. These Heritage Houses were built around the turn of the 20th Century when Kamloops was still a relatively new Incoporated Municipality (1893). This particular home is known as the Dr. Mark S. Wade House, built in 1905 by the Eye, Ear and Throat Specialist who came to Kamloops in 1895 from Victoria, B. C. It is located at 95 St. Paul Street West, a street known for its Victorian houses, many featuring a prominent veranda. Because Kamloops can get significantly hot in the summer, the front porches still provide a welcome respite from the heat of the day. About the most exciting month is November. Moody, always in flux, caught between Autumn and Winter, November features days that are intriguing to wake up to. I never know if, when glimpsing out the window first thing in the morning, I’m going to see flakes of snow drifting down or one of those assure November skies. Not far from the town of Clearwater, British Columbia, (about an hour’s drive North) is Wells Gray Provincial Park. 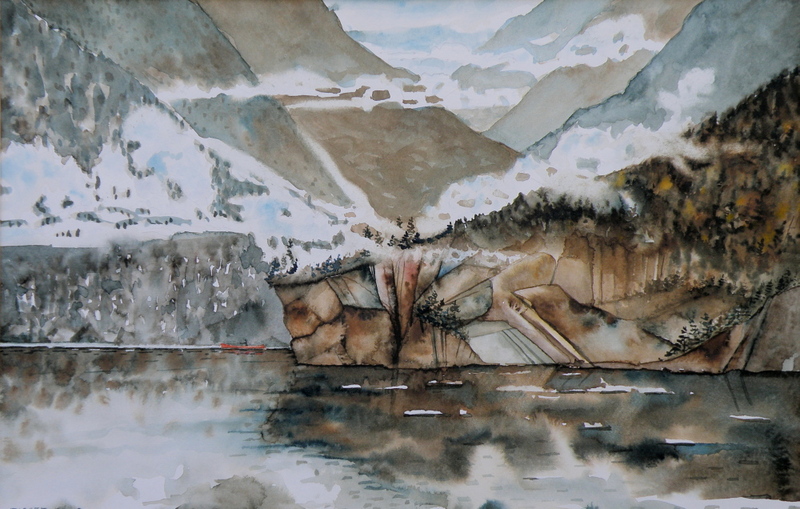 One of its most pristine lakes is Mrytle Lake, and I’ve done two watercolours of this same lake. 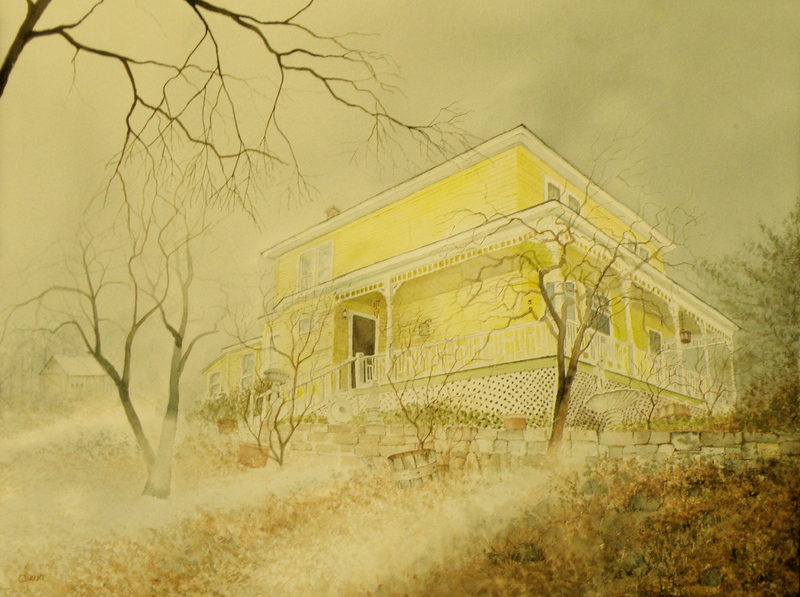 The first is rendered in a very traditional style, relying on a photograph . 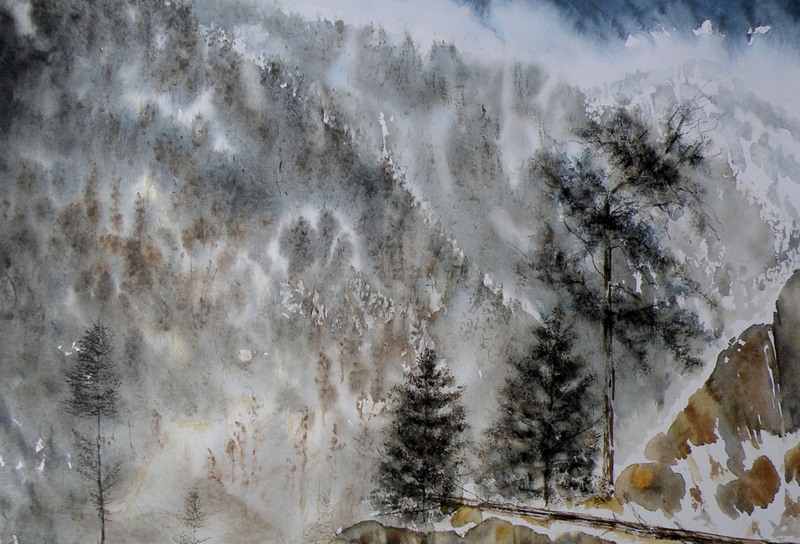 . .
Another version of the same painting was done from memory, not relying at all on any photographic image. Both paintings are now in private collections.